As the Christmas wind-down approaches inertia, in time-honoured tradition along with ghastly jumpers and inappropriate comments on social media, we signal the closing down of Legal Business HQ with a look back at the stories that made our year. So, what mattered to you? Twenty five years since Legal Business launched to chronicle the dramatic changes in the legal profession much has changed and yet stays the same. Still, if you were going to launch the first publication to focus on the UK’s commercial legal sector, you couldn’t have picked a better time than 1990. 25 years ago Legal Business was launched to chronicle a rapidly changing profession in the wake of Big Bang. We look back to identify 25 defining figures, events and trends that shaped a world-beating profession. The curious nature of the legal industry means that as radically as things seem to change, they stay the same. In January 1990 the City was still being defined by the Big Bang de-regulation of London’s financial services market, even though boom was rapidly turning to bust. Leading City law firms were still basically domestic practices built around English practices with limited branch networks. An elite City law firm would not have generated much more than £100m in a good year. 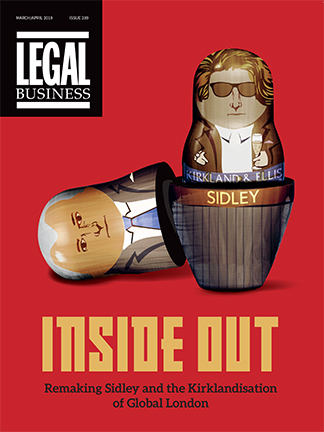 That scale and internationalisation would change in the coming decade – for all the talk of supposedly radical upheaval in the modern legal industry – the shake-up in the profession seen in the 1990s at the very least matches and probably outdoes anything that has happened since the turn of the millennium. Alex Novarese, editor-in-chief of Legal Business, sat down with Lex 100 recently to discuss the current state of the legal industry and its potential future for those considering a career in law. After a decade based in Ansdell Street in leafy Kensington, Legal Business and the entire Legalease family are moving to more central, larger premises in Fleet Street. ‘So, are you enjoying it?’ I’ve lost count of the number of times I have been asked the question since joining Legal Business last February. The question makes me feel awkward because I’m not a positive person. I try to be but I know I’m not. But the honest answer as I pass the one-year mark is: ‘Yes, I’ve enjoyed it. So much actually that the gloomy part of myself keeps waiting for it to go wrong.’ I know of no better measure than that. We take a sizeable step in the evolution of Legal Business today with the launch of a new iPad edition, which we will be rolling out to our subscribers. The app launches after months of development to coincide with our September edition, traditionally the largest of the year in which we publish our annual LB 100 coverage of the financial results of the UK’s largest law firms.